When editing a KB document, an author has the option of flagging their changes as a minor change. By default, this box is already checked. You can change this default behavior in your site using the 'Draft minor change default' option. Navigation: KB Admin Tools> Site Pref tab > Group Spaces link. This will lead you to the Group Spaces screen. You will be presented with a table. The first item in this table is the KB Site you are currently in. Click on the Edit button in that row. In the image below, row number 1 in this table is that of the KB User's Guide. The Edit button is circled in red. Clicking on the Edit button will take you to a table called Group Spaces Options. In this screen, there are a number of settings. The Draft minor change default option can be set to Yes or No from this screen. In the image below, the Draft minor change default is set to the defaulted Yes, the dropdown menu in this field also contains the option of No. If set to Yes, the Minor Change checkbox will be checked by default when a document is updated. It bypasses the review and re-activation on the part of sharing groups which have previously approved the document for their sites. 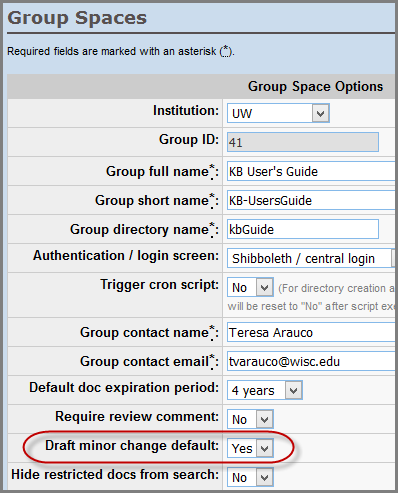 In other words, if "Minor Change" is checked when the document is activated the changes will automatically be pushed out to any groups sharing that document. The sharing group will not need to approve the changes. It excludes the document from the "Most Recently Updated Documents" list. It prevents an email notification from going out to users who have "Subscribed to changes".